Since the seventh grade, Cedar City natives Kaylin Shelley and Samara Rangel have had leadership, service and professional development opportunities available to them through the TRIO Program, hosted by Southern Utah University. Graduating yesterday, May 26, from Cedar City’s Canyon View High School, these all-star students had already received their associate’s degrees through SUU’s Success Academy on April 30. Shelley and Rangel are members of SUU’s TRIO Educational Talent Search (ETS) Program through Canyon View, a program that recruits students from low-income, first-generation families and helps build a desire and passion for academics and higher education. Together, the two have been offered more than $300,000 in educational funding through several universities and independent scholarship programs, and both have decided to continue their studies at Southern Utah University. 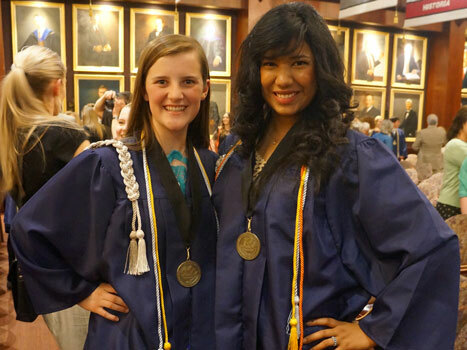 Shelley and Rangel are on an upward trajectory toward academic achievement and accomplishment. Through this program, Rangel and Shelley were encouraged to apply for a variety of scholarships, one of which was the Daniels Scholarship, a Denver-based fund that supplies four-year scholarships at any accredited nonprofit college or university in the United States. Among 2,200 applicants, Shelley and Rangel are two outstanding recipients of this full-ride scholarship. Encouraged to excel at their studies by mentors from SUU and Canyon View, Shelley and Rangel exemplify the American dream of higher education regardless of race, ethnic background or economic circumstances. Kaylin Shelley is an all-star volunteer and aspiring humanitarian. Her goal is to earn a bachelor’s degree in nursing and psychology from SUU and serve individuals and communities worldwide. At an early age, she realized the need to build her resume and develop writing, speaking and leadership skills. Getting involved with ETS was life changing for her, a decision for which she will always be grateful, she said. As a psychology major, possible Spanish minor and pursuing the international relations certificate, Samara Rangel has found the perfect combination of her passions in learning and life. She is already involved with the psychology department at SUU and joyously anticipates her continued learning this fall. Rangel credits her mom as the biggest influence in her life and the reason behind her success and determination. Housed by Southern Utah University and promoted in middle and high schools in the area, the federal TRIO Program includes five outreaches stationed across the nation, aimed at motivating and supporting students from disadvantaged backgrounds. TRIO is an educational opportunity outreach program targeted to serve and assist students on their academic journey from middle school to post-baccalaureate opportunities and careers. The Educational Talent Search Project is one such outreach program that recruits students from Iron, Beaver and Kane counties in southern Utah, helping them develop study skills, fill out college and scholarship applications and plan for future career paths.